Game of Thrones season 8 is set to premiere on April 14th, 2019. This will be the final season of Game of Thrones and fans have been waiting eagerly for this 6 episode season for almost 2 years, since season 7 concluded on August 27th, 2017. There are plenty of prop bets available for Game of Thrones season 8, including which character will sit atop the throne at the conclusion of the series. Most of the other props you will find involve when characters will die (who will die first). On this page I will look at some of the prop betting options using the odds from Bovada.lv, our top rated betting site for Game of Thrones due to their huge selection of prop bets. If you live outside of the USA I’d suggest SportsBetting.ag, our top rated site that accepts players from everywhere in the world. At the bottom of the page you will find a simple 3 step guide you can follow to get your Game of Thrones bets placed online. 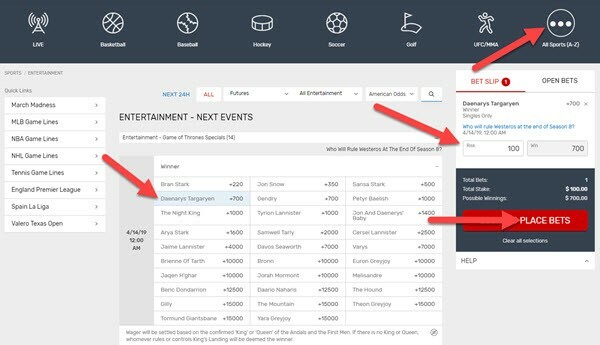 As I mentioned above, Bovada.lv is our recommended betting site for Americans looking to bet on Game of Thrones props. They have a huge selection including head to heads of who will perish first. Who Will Rule Westeros At End of Season 8? Bran Stark is the favorite to lead Westeros at the conclusion of this season. Jon Snow, Sansa Stark and Daenarys are also being given a good shot. You could also go off the board and take Jon and Daenerys’ Baby at odds of +1400. The Greyjoy’s are expected to be on the chopping block to start season 8, but Sansa Stark could also be a quick casualty according to these odds. Cersei is probably the character most fans want to see killed. This prop shows some of the most interesting bets you can make on this season at Bovada. Arya and Jaime are the two favorites to kill Cersei, and I would be surprised if it wasn’t one of those two. 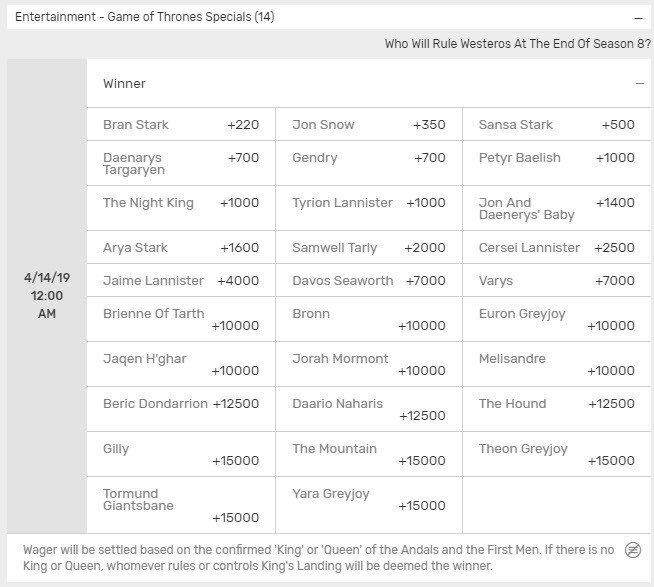 **Other bets you can make include when Cersei will die, and a big selection of head to heads for first to perish. Follow these three steps to get your Game of Thrones bets placed before Season 8 begins. Click the above link and fill out the short overlay form on the home page to open your account. Log into your new Bovada account and click ‘Deposit’. Select Visa, MasterCard, or Bitcoin as your deposit method and follow the instructions to complete the deposit. New sign ups receive a 50% matching bonus up to $250 on first deposits at Bovada. You can claim this bonus in the “My Rewards” section of the site. Click on ‘Sports’ from the top menu bar, select ‘Open Sports’ and click ‘Entertainment’ to bring up the GoT odds. Select the bet(s) you want to make and enter your risk amount for each wager on the Bet Slip. When you are happy with the risk and return click on ‘Place Bets’ to lock in your wagers. Here’s a screenshot with some arrows to show the steps.